A recent episode of Man Fire Food featured an impressive Uruguayan grill. It was neat, efficient, and had a massive grilling surface: the barbecue of your dreams. While they were busy cooking a whole flock of spatchcocked chickens, they filled the grates with a field of corn, husks still attached and neatly tied. This is how to grill your corn and eat it, too. Just like the always popular Mexican street corn, here’s a quick way to prep your corn so it’s cooked ahead of time and ready to eat. 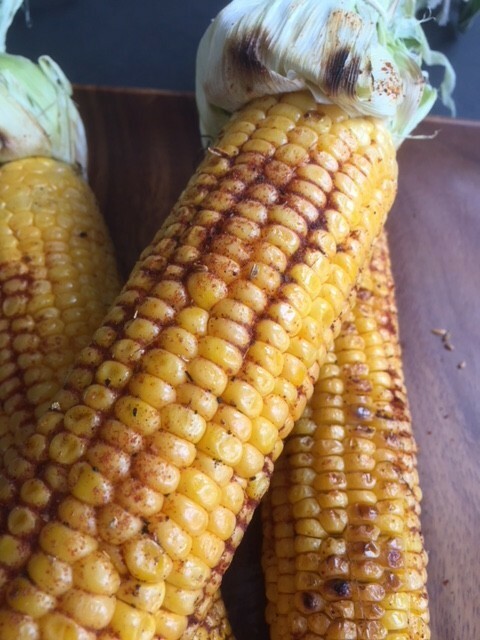 Spicy, and full of summer flavor, the rub gets just a bit of smoky heat from the Spanish paprika, while the fennel amps up the sweetness of the corn. Leaving the husks attached at one end makes a nice handle, plus it’s just plain fun. Be careful to leave the husks off the hottest part of the grill rack so that they do not start to burn. Serve as is, or you can smear with mayonnaise (or not), and/or sprinkle with grated queso fresco and cilantro just before serving. Peel husks from corn, removing and discarding silk, but leaving husk attached at one end. Using a small piece of kitchen twine, tie husks about two inches from end of corn. Trim ends of twine. Brush all sides of corn with melted coconut oil and rub with lime. Using a mortar and pestle, combine spices and crush. Grill corn over medium heat, turning often, until well marked and tender, about 10 to 12 minutes, sprinkling corn with seasoning as it cooks. Remove from grill and let cool slightly. Sprinkle with grated queso fresco and chopped cilantro if desired.